I’ve finally found an email system that works, and I can prove it. 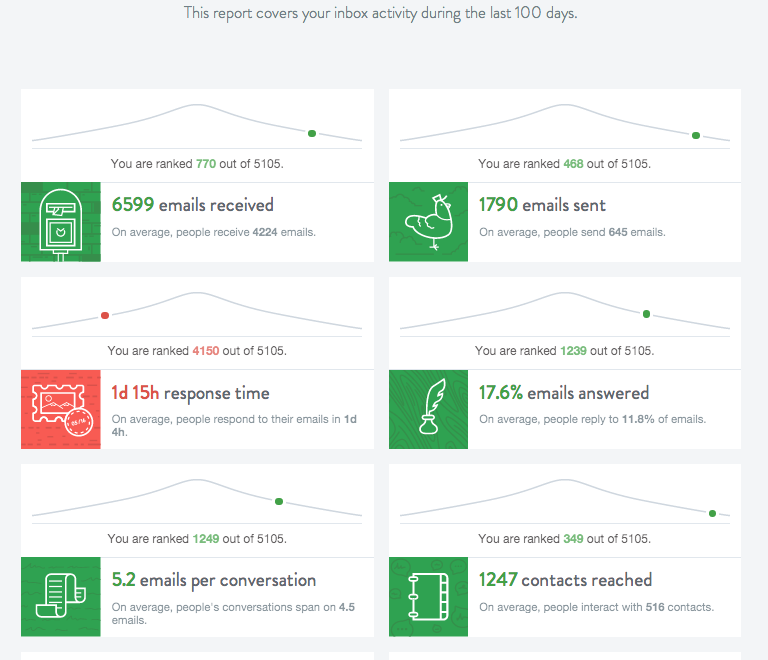 Using the same tool I wrote about in my War On My Inbox post, we can see that I’ve shaved about 10 hours off my response time while increasing my percentage returned. So there are a couple of parts to my new system, one high-tech system and one simple trick. On the left is his empty inbox and on the right are all the messages he has flagged as needing some sort of attention. The single biggest key for me was to turn on the feature that automatically loads the next email instead of sending you back to the index. This makes it much more likely that you’ll process “just one more” and you don’t waste time scanning the index to pick the next email to process. 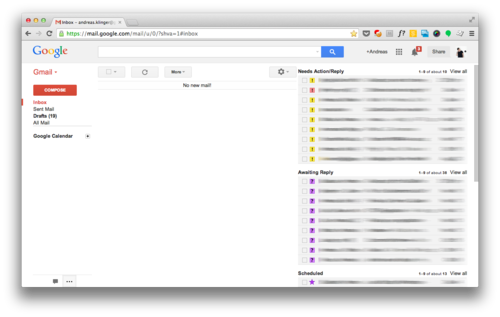 Using his system I can efficiently get to Inbox Zero every day; it has been a game changer. 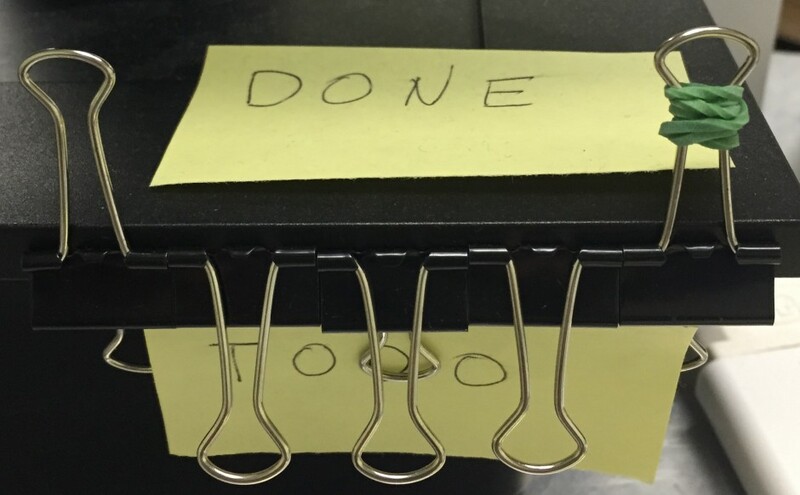 I flip up the paper clip from todo to done each time I finish a task; it makes a very satisfying click. And the paper clip with the green rubber band, that one represents getting to Inbox Zero. The physical system has really made all the difference for me. With a glance I can see how productive my day is so far, and it motivates me to get things done. My system works well with my desk setup, but one could use almost anything to track work done. Moving marbles from one bowl to another, or marching action fiction across the desk. Really you’re only limited by your imagination. 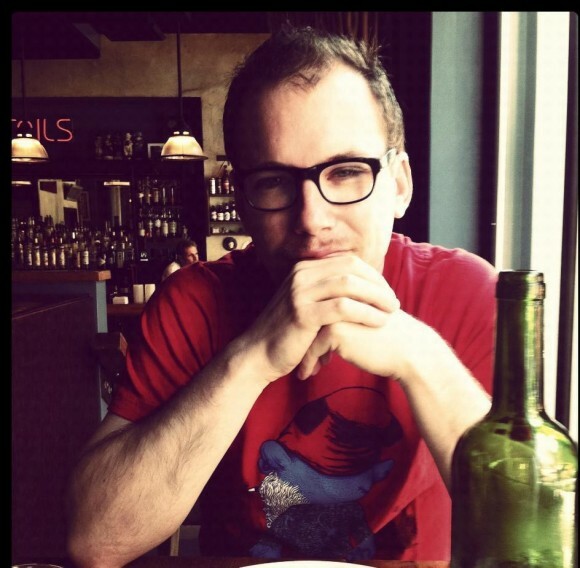 I’ve written before about my struggles with my inbox. 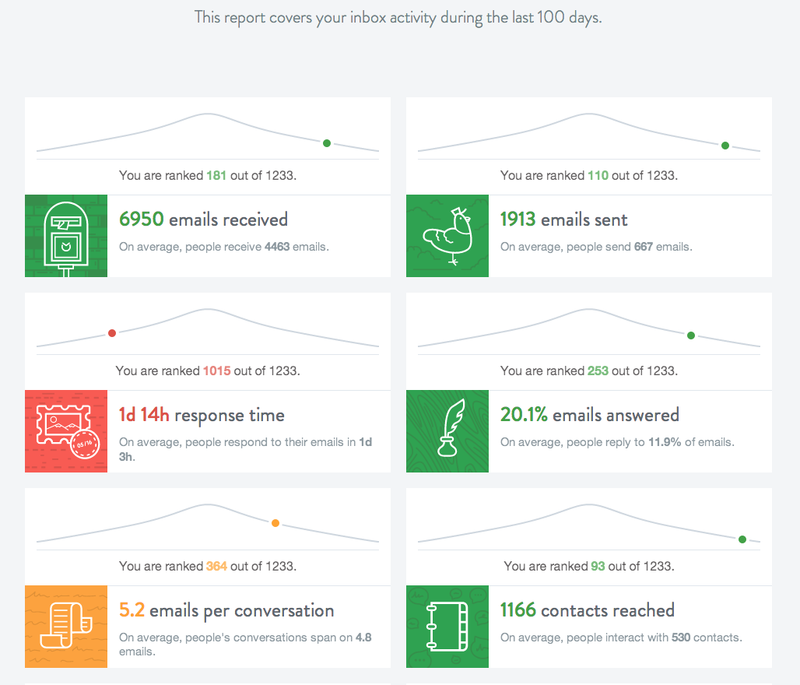 Thanks to Product Hunt I recently found The Inbox Checkup, an app that let’s me compare my email issues with others. This was from my first run in August. 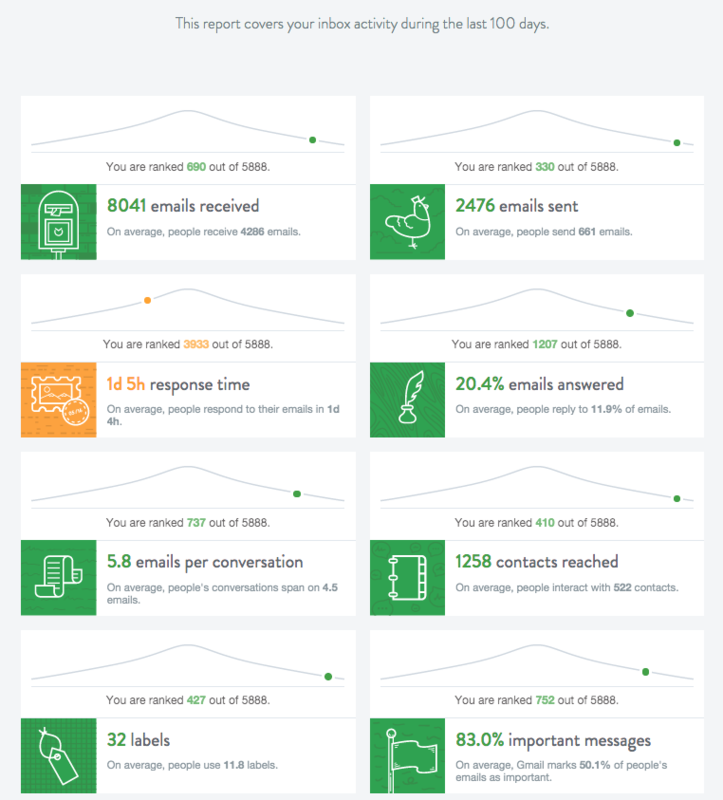 As you can see, I receive a lot more emails than the average person, and I send even more. But this volume has hurt my response time. I re-ran this again today so I could compare results. As you can see, over the past couple months my response time actually increased by an hour. I’m a firm believer in the idea that we optimize what we measure. I’m going to keep tracking response times with an eye towards bringing my time down. Expect an update in a couple more months. Lately I’ve felt like I was in a bit of a rut so I decided to try an experiment to be more productive. I started by making a list of things I wanted to do. To do all this I decided to wake up an hour earlier each day and use the Streaks app to track my goals. On the first day I woke up early, went to my local coffee shop and found this great video/article on forming habits my Pocket App. It must be a sign. 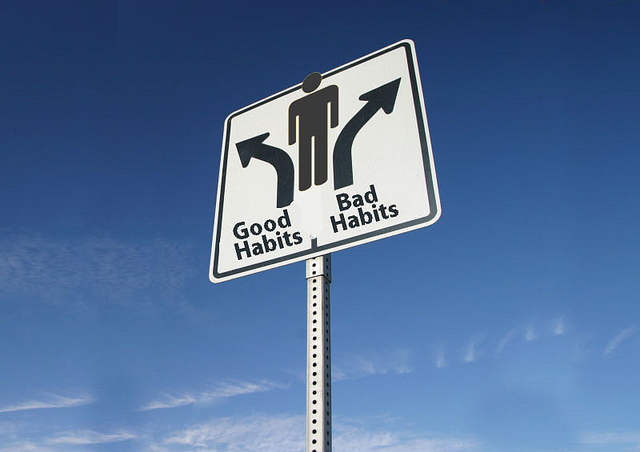 One of the most interesting things Maneesh discusses is keystone habits; a change you make that cause other habits to naturally happen in your life. One of those is waking up early. The thing about waking up early is that it is a keystone habit. A keystone habit is a single habit, a solitary act that once implemented it starts a chain reaction that begins other habits naturally. I have to admit, I’m not a morning person but getting so much done before my day really starts makes me feel like a superhero. The reading is generating tons of new ideas and tracking is pushing me not to procrastinate. So I challenge you to start your own Week of Awesome. Let me know what tools you use and how it turns out. I’ll have my people talk to your people and set something up. I’ve always wanted to say that. And recently a founder and I needed to find time to grab breakfast, so his person consulted my person and a meeting appeared on our calendars. The wrinkle: we both have the same people. Enter Super Calendar. Part human, part software, all awesome for $80 a month. They will schedule meetings according to your preferences and put them directly on your calendar. Uber Conference is another service I’ve recently found that I can’t live without. It makes scheduling conference calls a breeze, and the ability to see who is talking is a feature you didn’t know was necessary until you tried it. Finally, I used my Fancy Hands team to take this handwritten blog post and transcribe it. I like to write in my moleskin notebook since it prevents me from getting distracted by the web. Fancy Hands makes this process as easy as typing my first draft, but without the distractions of web connectivity. They even found the comic above when I wrote: “<Insert comic about The Internet vs. Term Paper>”.